^ Italie, Hillel (July 2, 2007). "Entertainment | Like "Star Wars" and "Star Trek," Potter is a modern phenomenon | Seattle Times Newspaper". Seattle Times. Associated Press. Archived from the original on June 28, 2011. Retrieved October 19, 2011. ^ "Business of 'Star Trek': Franchise celebrates 50th anniversary". CGTN. July 26, 2016. Retrieved February 24, 2017. ^ Saadia, Manu (January 13, 2017). "Why Peter Thiel Fears "Star Trek"". The New Yorker. ISSN 0028-792X. Retrieved May 28, 2017. ^ Gibberman, Susan. "RODDENBERRY, GENE". Museum of Broadcast Communications. Archived from the original on October 11, 2011. Retrieved October 19, 2011. ^ Keonig, Rachel (August 29, 1986). "Roddenberry, Eugene Wesley 1921– (Gene Roddenberry)". In Commire, Anna (ed.). Something about the Author. 45. Detroit: Gale Research. pp. 168–179. ISBN 978-0-8103-2255-4. ISSN 0276-816X. ^ Snyder, J. William, Jr. (1995). "Star Trek: A Phenomenon and Social Statement on the 1960s". www.ibiblio.org. Retrieved October 19, 2011. ^ Grothe, DJ (May 29, 2009). "Susan Sackett - The Secular Humanism of Star Trek]". www.pointofinquiry.org. Retrieved September 27, 2016. ^ Goulart, Woody. "Gene Roddenberry". woodygoulart.com. Archived from the original on October 31, 2011. Retrieved March 25, 2019. ^ a b c Day, Dwayne. "Social History :Star Trek as a Cultural Phenomenon". Centennial of Flight Commission. Archived from the original on October 9, 2012. Retrieved May 31, 2013. ^ MacDonald, Glenn (March 12, 2015). "William Shatner talks 'Star Trek,' sci-fi and fans". The News & Observer. Retrieved August 31, 2015. ^ Roddenberry, Gene (March 11, 1964). "Star Trek is…" (PDF). www.ex-astris-scientia.org. Archived from the original (PDF) on September 24, 2006. Retrieved June 26, 2009. ^ a b c d e f Davies, Máire Messenger; Pearson, Roberta (August 2007). "The Little Program That Could: The Relationship between NBC and Star Trek". In Hilmes, Michele (ed.). NBC: America's network. Berkeley: University of California Press. pp. 209–223. ISBN 978-0-520-25079-6. ^ "Bjo Trimble: The Woman Who Saved Star Trek - Part 1". www.startrek.com. August 31, 2011. Retrieved January 12, 2012. ^ Shult, Doug (July 5, 1972). "Cult Fans, Reruns Give Star Trek an out of This World Popularity". Green Sheets. The Milwaukee Journal. 90 (230) (Edition 3 / Latest ed.). Los Angeles Times New Service. Retrieved October 19, 2011. ^ "Celebrating 40 Years since Trek's 1st Convention". www.startrek.com. January 20, 2012. Retrieved August 1, 2013. ^ Teitelbaum, Sheldon (May 5, 1991). "How Gene Roddenberry and his Brain Trust Have Boldly Taken 'Star Trek' Where No TV Series Has Gone Before : Trekking to the Top". Los Angeles Times. ISSN 0458-3035. Retrieved May 11, 2011. ^ Levesque, John (January 6, 2001). "UPN in search of post-'Voyager' flagship". Seattle Post-Intelligencer. Archived from the original on December 5, 2010. Retrieved June 30, 2009. ^ "Fan Groups, Sites Rally on Behalf of Enterprise (UPDATE)". www.startrek.com. January 17, 2010. Archived from the original on October 19, 2011. Retrieved March 27, 2019. ^ "Star Trek: Enterprise Cancelled!". www.startrek.com. February 3, 2005. Archived from the original on January 11, 2010. Retrieved October 19, 2011. ^ "Uniting Star Trek Fans". www.trekunited.com. Archived from the original on February 2, 2009. Retrieved December 18, 2007. ^ Adler, Margo (May 6, 2009). "Some Older 'Star Trek' Fans May Skip This Voyage". NPR. Retrieved October 19, 2011. ^ Hinman, Michael (June 23, 2009). "'Star Trek' Becomes Highest Grossing Franchise Film". Airlock Alpha. Retrieved October 19, 2011. ^ Pascale, Anthony (April 6, 2008). "Paramount Already Thinking About Sequel To Abrams Star Trek". trekmovie.com. Retrieved October 19, 2011. ^ Pascale, Anthony (November 23, 2011). "Star Trek Sequel To Be Released May 17, 2013 – In 3D". trekmovie.com. Retrieved November 25, 2011. ^ McNary, Dave (December 13, 2014). "'Star Trek 3' Sets July 8, 2016, Release Date". Variety. Retrieved December 24, 2014. ^ Holmes, Brad (March 26, 2018). "Why Star Trek Beyond Wasn't A Box Office Hit, According To Simon Pegg". www.cinemablend.com. Retrieved January 28, 2019. ^ Fitzpatrick, Kevin (April 12, 2011). "Bryan Singer's TV Star Trek Details Emerge". www.ugo.com. Archived from the original on April 16, 2011. Retrieved January 18, 2012. ^ Straczynski, J. Michael; Zabel, Bryce. "Star Trek, Reboot, 2004" (PDF). bztv.typepad.com. Archived from the original (PDF) on May 6, 2010. Retrieved October 19, 2011. ^ Fitzpatrick, Kevin (April 7, 2011). "Jonathan Frakes Talks Bar Karma, Star Trek, and Yes, Gargoyles". www.ugo.com. Archived from the original on April 11, 2011. Retrieved August 23, 2015. ^ Pascale, Anthony (May 3, 2010). "Update on Star Trek: Final Frontier – The New Star Trek Animated Series That Never Was". trekmovie.com. Retrieved January 18, 2012. ^ Goldberg, Lesley (November 2, 2015). "'Star Trek' TV Series in the Works". The Hollywood Reporter. Retrieved November 4, 2015. ^ a b Andreeva, Nellie (June 19, 2017). "'Star Trek: Discovery' Gets September Premiere Date On CBS". Deadline Hollywood. Retrieved June 20, 2017. ^ a b Lee, Luaine (August 18, 2006). "KRT Wire | 08/18/2006 | 'Star Trek' turns 40". San Jose Mercury News. McClatchy News. Tribune News Service. Archived from the original on September 1, 2006. Retrieved December 15, 2008. ^ Trimble, Bjo (October 1986). Stine, Hank (ed.). On the Good Ship Enterprise: My 15 Years with Star Trek (Reprint ed.). Norfolk, Virginia: The Donning Company. p. 33. ISBN 978-0-89865-253-6. ^ Dursin, Andre (November 14, 2006). "The Aisle Seat by Andy Dursin". www.andyfilm.com. Retrieved October 19, 2011. ^ a b c d e f Ayers, Jeff (November 14, 2006). Voyages of the Imagination: The Star Trek Fiction Companion. New York: Pocket Books. ISBN 978-1-4165-0349-1. ^ "Star Trek". IMDb. Retrieved March 26, 2019. ^ "Star Trek Animated - The Series that ran from 1973 - 1974". www.sciencefictionbuzz.com. Archived from the original on July 16, 2011. Retrieved October 19, 2011. ^ "Cult - Star Trek - Next Generation - Trivia". BBC. Archived from the original on December 31, 2006. Retrieved March 26, 2019. ^ "Emissary, Part I". www.startrek.com. Retrieved August 21, 2006. ^ Lense. "Review of "Inter Arma Enim Silent Leges" - Star Trek Fans". scifi.about.com. Archived from the original on April 7, 2003. Retrieved October 29, 2006. ^ Sturgis, Amy H. "Star Trek Voyager : Final Episode : Review". www.revolutionsf.com. Archived from the original on January 16, 2004. Retrieved August 24, 2006. ^ "Star Trek: Voyager [TV Series] Synopsis - Plot Summary". Fandango. Archived from the original on January 30, 2012. Retrieved October 19, 2011. ^ "Star Trek: Enterprise Summary". www.starpulse.com. Archived from the original on September 29, 2007. Retrieved March 26, 2019. ^ Lee, Patrick (May 14, 2005). "Star Trek: Enterprise Series Finale | Movie and TV Reviews | SCI FI Weekly". www.scifi.com. Archived from the original on January 1, 2007. Retrieved January 16, 2009. ^ Leao, Gustavo (December 17, 2005). "Anthony Montgomery Says "These Are The Voyages..." Not an Effective Finale". trekweb.com. Archived from the original on March 7, 2006. Retrieved October 19, 2011. ^ Slotek, Jim (May 13, 2005). "Star Trek: E lamely goes away". Toronto Sun. p. E4. ^ Ausiello, Michael; Roots, Kimberly (August 10, 2016). "'Star Trek: Discovery' Spoilers: Amanda Grayson Role in CBS Reboot". TVLine. Retrieved April 30, 2017. ^ Frankel, Daniel (December 7, 2016). "Moonves: Netflix international sales pay for entire 'Star Trek' production cost". www.fiercevideo.com. Retrieved January 16, 2017. ^ Andreeva, Nellie (May 17, 2017). "'Star Trek: Discovery' Order Increase &; Companion Show CBS All Access". Deadline Hollywood. Retrieved May 18, 2017. ^ Stanhope, Katie (May 17, 2017). "'Star Trek Discovery' Official Trailer". The Hollywood Reporter. Retrieved May 18, 2017. ^ Hibberd, James (July 17, 2017). "Star Trek: Discovery producer explains why the Klingons changed". Entertainment Weekly. Retrieved July 18, 2017. ^ Anderton, Ethan (July 21, 2017). "Star Trek Discovery Comic-Con Exhibit Reveals Starfleet, Klingon and Vulcan Props, Costumes & Ships". /Film. Retrieved July 22, 2017. ^ Goldberg, Lesley (August 4, 2018). "Patrick Stewart to Reprise 'Star Trek' Role in New CBS All Access Series". The Hollywood Reporter. Retrieved August 4, 2018. ^ Patten, Dominic (January 14, 2019). "Michelle Yeoh 'Star Trek' Spinoff In Development At CBS All Access". Deadline Hollywood. Retrieved March 17, 2019. ^ Andreeva, Nellie (October 25, 2018). "'Star Trek: Lower Decks' Animated Series Ordered By CBS All Access". Deadline Hollywood. Retrieved October 25, 2018. ^ Otterson, Joe (February 13, 2019). "'Star Trek' Animated Kids Show in the Works at Nickelodeon – Variety". Variety. Retrieved February 17, 2019. ^ "Star Trek Beyond (2016) - Release Info". IMDb. Retrieved July 27, 2016. ^ Pascale, Anthony (July 22, 2018). "Exclusive: Anson Mount Talks Playing Pike, Reveals How Many Episodes He's In Of 'Star Trek: Discovery'". TrekMovie.com. Retrieved July 23, 2018. ^ Ulster, Laurie (August 14, 2018). "Ethan Peck Cast As Spock On 'Star Trek: Discovery' Season 2". TrekMovie.com. Retrieved August 15, 2018. ^ Pascale, Anthony (July 23, 2018). "Exclusive: Wilson Cruz Talks About Dr. Culber's Mysterious Return In 'Star Trek: Discovery' Season 2". TrekMovie.com. Retrieved July 23, 2018. ^ Harmetz, Aljean (November 2, 1986). "New 'Star Trek' Plan Reflects Symbiosis of Tv and Movies". The New York Times. ISSN 0362-4331. Retrieved February 11, 2015. ^ Cloud, John (January 25, 2002). "Star Trek Inc". Time. Retrieved June 28, 2017. ^ Lee, Newton (August 2, 2014). "From a Pin-up Girl to Star Trek's Holodeck: Artificial Intelligence and Cyborgs". In Lee, Newton (ed.). Digital da Vinci: Computers in the Arts and Sciences. New York: Springer Science+Business Media. pp. 1–22. ISBN 978-1-4939-0964-3. ^ Marshall, Rick (April 14, 2009). "'Star Trek: The Next Generation' Goes Manga, But Will Picard Lose The Captain's Chair? » Splash Page". MTV. Archived from the original on July 14, 2011. Retrieved October 19, 2011. ^ "Star Trek: The Next Generation". IDW Publishing. October 6, 2006. Archived from the original on October 25, 2006. Retrieved December 26, 2006. ^ "FAQ". www.startrekonline.com. Archived from the original on October 12, 2011. Retrieved October 19, 2011. ^ "Announcing Star Trek Based Games from WizKids". WizKids. June 8, 2010. Archived from the original on June 11, 2011. Retrieved June 8, 2010. ^ "Great Animated Adventures Episodes". www.startrek.com. Archived from the original on August 5, 2006. Retrieved August 24, 2006. ^ "Introduction to Outer Space (1958)". Federation of American Scientists. March 26, 1958. Archived from the original on October 6, 2015. Retrieved March 26, 2019. ^ "TREK NATION — Rich Text Format". 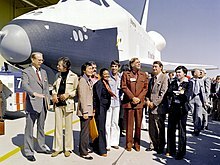 eugene.roddenberry.com. Archived from the original (RTF) on February 5, 2005. Retrieved August 24, 2006. ^ "Trekkies (1997)". IMDb. Retrieved August 24, 2006. ^ "TV Guide Names the Top Cult Shows Ever". TV Guide. June 29, 2007. Retrieved October 19, 2011. ^ Ewalt, David M. (May 18, 2005). "Star Wars Vs. Star Trek". Forbes. Retrieved September 13, 2007. ^ Ho, Richard (May 14, 1995). "Trekkers VS Lucasites". The Harvard Crimson. Retrieved May 18, 2009. ^ Kelly, Heather (September 3, 2014). "Qualcomm Tricorder X Prize: Race to create a tricorder". CNN. Retrieved September 7, 2014. ^ Laytner, Lance (2009). "Star Trek Tech". editinternational.com. Archived from the original on July 10, 2011. Retrieved March 26, 2019. ^ Evangelista, Benny (March 15, 2004). "TREK TECH / 40 years since the Enterprise's inception, some of its science fiction gadgets are part of everyday life". San Francisco Chronicle. Retrieved May 14, 2010. ^ Parsons, Ed (March 27, 2006). "Google Earth inspiration was Star Treks tricorder !!". edparsons.com. Retrieved October 19, 2011. ^ Quinion, Michael (August 6, 1996). "World Wide Words: Beam me up, Scotty!". worldwidewords.org. Retrieved August 24, 2012. ^ Drum, Ryan W.; Gordon, Richard (August 1, 2003). "Star Trek replicators and diatom nanotechnology". Trends in Biotechnology. Cell Press. 21 (8): 325–328. doi:10.1016/S0167-7799(03)00169-0. PMID 12902165. ^ Dumoulin, Jim (March 18, 1994). "Shuttle Orbiter Enterprise (OV-101)". Kennedy Space Center. Retrieved November 17, 2012. ^ Worstall, Tim (October 5, 2015). "Star Trek Economics Is Just True Communism Arriving". Forbes. Retrieved October 23, 2016. ^ Bently, Rick (September 5, 2016). "5-year mission became 50-year journey for 'Star Trek'". Detroit Free Press. Tribune News Service. Retrieved September 6, 2016. ^ Hasan, Zaki (April 19, 2017). "INTERVIEW: Steve Wozniak on Sci-Fi, Comic Books, and How Star Trek Shaped the Future". Huffington Post. Retrieved January 2, 2018. ^ "STAR TREK: George Takei Is Ready To Beam Up". Sci-Fi Channel. Archived from the original on March 25, 2009. Retrieved March 27, 2019. ^ "Cult - Star Trek - Patrick Stewart - Galaxy Quest". BBC. Archived from the original on January 13, 2014. Retrieved March 27, 2019. ^ Mullich, Jon. "Welcome to madbeast.com - The Jon Mullich site". www.madbeast.com. Retrieved October 19, 2011. ^ "Lamplighters Music Theatre presents Our Annual Champagne Gala & Auction STAR DREK: THE GENERATION AFTER THAT" (PDF) (Press release). Lamplighters Music Theatre. October 6, 2009. Archived from the original (PDF) on January 12, 2012. Retrieved May 5, 2013. ^ Whitmore, Linda (November 10, 2009). "'Star Wreck,' from Finland with love". Los Angeles Times. Archived from the original on October 27, 2016. Retrieved December 18, 2017. ^ Friedman, Dan (June 6, 2013). "IRS official apologizes for wasting funds on 'Star Trek' spoof video". New York Daily News. Retrieved May 24, 2016. ^ Grier, Peter (June 4, 2013). "How much did IRS spend filming 'Star Trek' spoof?". The Christian Science Monitor. Retrieved May 24, 2016. ^ Opam, Kwame (May 16, 2017). "The first trailer for The Orville promises Star Trek crossed with Family Guy's humor". The Verge. Retrieved May 18, 2017. ^ Howell, Elizabeth (August 14, 2014). "'Star Trek: Axanar' Fan Film Warps Beyond Crowdfunding Goal". Space.com. Retrieved September 24, 2014. ^ Axanar Productions (March 2, 2014). "Star Trek: Prelude to Axanar by Axanar Productions". Kickstarter. Retrieved October 9, 2014. ^ a b Luckhurst, Roger (January 6, 2005). "Ending the Century: Literature and Digital Technology". In Marcus, Laura; Nicholls, Peter (eds.). The Cambridge History of Twentieth-Century English Literature. Cambridge: Cambridge University Press. ISBN 978-0-521-82077-6. ^ Bacon-Smith, Camille (November 16, 1986). "Spock Among Women". The New York Times Book Review. Retrieved March 27, 2019. ^ Kustritz, Anne (January 13, 2004). "Slashing the Romance Narrative". The Journal of American Culture. 26 (3): 371–384. doi:10.1111/1542-734X.00098. eISSN 1542-734X. ^ "Fan Films". www.startrek.com. June 23, 2016. Retrieved January 16, 2017. ^ Martinelli, Marissa (July 13, 2016). "Crowdfunding gave us a golden age of amateur Star Trek—and then led to its downfall". Slate. Retrieved January 16, 2017. ^ "Most successful sci-fi TV franchise". Guinness World Records. October 7, 2016. Retrieved October 11, 2016. ^ Logan, Michael (August 24, 1996). "10 Truly Stellar Episodes". TV Guide. Vol. 44 no. 34. pp. 22–25. ISSN 0039-8543. ^ Popkin, Helen A.S. (March 7, 2010). "Oscar blog: A blow-by-blow of the night's action". MSNBC. Archived from the original on November 19, 2011. Retrieved March 7, 2010. ^ Pascale, Anthony (February 11, 2010). "Star Trek Helps Bring Big Profits To Viacom & Paramount". Retrieved October 19, 2011. Ellison, Harlan (January 1996). The City on the Edge of Forever. Benson, Maryland: Borderlands Press. ISBN 1-880325-02-0. Greenwald, Jeff (June 1998). Future Perfect: How Star Trek Conquered Planet Earth. New York: Viking. ISBN 0-670-87399-3. Krauss, Lawrence M. (September 1995). The Physics of Star Trek. New York: Basic Books. ISBN 0-465-00559-4. Lichtenberg, Jacqueline; Marshak, Sondra; Winston, Joan (July 1975). Star Trek Lives!. New York: Bantam Books. ISBN 0-553-02151-6. Projansky, Sarah; Helford, Elyce Rae; Ono, Kent (August 8, 1996). Harrison, Taylor (ed.). Enterprise Zones: Critical Positions on Star Trek. Boulder, Colorado: Westview Press. ISBN 0-8133-2899-3. Shatner, William; Kreski, Chris (October 1993). Star Trek Memories. New York: HarperCollins. ISBN 0-06-017734-9. Winston, Joan (November 1977). The Making of the Trek Conventions. New York: Knopf Doubleday. ISBN 0-385-13112-7.